This July 25, 2018, file photo shows Donald Trump's star on the Hollywood Walk of Fame after it was vandalized in Los Angeles. 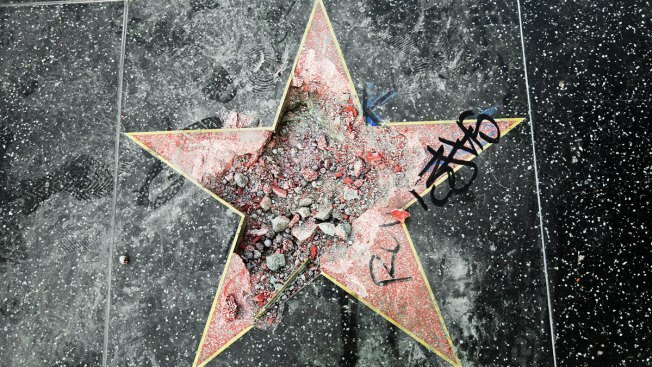 A man who smashed Donald Trump's star on the Hollywood Walk of Fame has been sentenced to three years' probation after pleading no contest to a felony count of vandalism. City News Service reports a judge also sentenced Austin Mikel Clay on Wednesday to attend psychological counseling and pay more than $9,400 to the Hollywood Chamber of Commerce. He must also perform community service. Clay took a pickax to Trump's star on Hollywood Boulevard in July. The star recognizes Trump for his work on the TV show "The Apprentice." It was quickly repaired. After he pleaded not guilty in August, Clay told reporters the vandalism was a "rightful and just act." He said he wanted to "bring about positive political change" and didn't believe prosecutors should have charged him.